WAKY Jingles, Promos, Production, Etc. On this page you'll find downloadable WAKY jingles, promos and other audio delights in MP3 format. Do you have any WAKY jingles or other on-air production to share? Drop us a line. We'll be happy to archive any WAKY jingle or promo tapes we don't already have to CD at no charge. Don Worsham of the Media Preservation Society writes: "I have spoken several times with former WAKY/McClendon DJ Jack Grady. He was at WAKY when the switch was made from WGRC. He indicated that the station also had the CRC Sing-A-Long jingles on the air. These were Mitch Miller sound-a-likes done by Tom Merriman in early 1961. There were 2 different series, #15 and #18." "The shout came about this way: It began with an idea I had to lay a WAKY shout over the first post of the song followed by an "X" in a row shout just before the vocal. This would open all music sweeps (which were few and far between). The first thing we did was the shout which was done in two takes. We followed with the "X" in a row shouts. Hear the way it sounded on the air in 1971. "After hearing the latter on the air, I wasn't happy with the way it sounded, but I did like the WAKY shout. One of the true benefits of this item was it worked like Pavlov's Dog Theory in that we would lay the shout in the first post or just before the vocal and as a result, whenever the song played I would see people lip syncing where the shout was or should have been. For a psych major like me this was super. "Anyway, on the shout are a black sales secretary named Brenda, Gary Burbank, Marsha the receptionist and myself. I took the raw version of the shout down to Allen-Martin (a local recording studio) and they added reverb to it and compressed it. (Super trivia: Allen-Martin used to be known as SAMBO which is short for Don Schwartz, Ray Allen and Hardy Martin. [The "BO" stood stood for Booking Organization.] All the Louisville hit songs were recorded there.)" "Shortly before my tenure at WAKY 790 in Louisville in 1980, they had a Mackenzie [Repeater] hard-wired across the program bus of the console. When the 'WACKY' shout tape did not stop, Bill Bailey, who had been there forever, simply opened the mic for help. 'REED! Get in here and STOP THIS CRAZY THING!' is what I'm told he kept saying on mic between shouts of WACKY, WACKY, WACKY! Ahhh...the good old days..."
"Although Mackenzie machines were popular, WAKY didn't have one. The WAKY shout lived on a cart in a single unit machine behind the remote control equipment rack. It was actually in the newsroom, much to the dismay of Reed Yadon. We had a remote start button for it on the main control board." We don't know if WAKY ever used these, but they were on the jingle company's demo for the package. 7:04 - 3319 KB Download Them! Note: While many of these acapellas sound nearly identical, the basic "79 WAKY" cuts in this package were actually sung in different keys so they'd musically blend into the intro of the record they were played before (providing the record was labeled correctly). These jingles were taken straight from the station's master tape. Unfortunately, the tape had deteriorated to the point that many of the cuts are of marginal quality. Note: The PAMS Philadelphia Story, Shaft and Shotgun jingles were all recorded in the same November 1972 session. See the PAMS cue sheet here. For more information on JAM jingles, go to the JAM Website. For more information on TM jingles, go to the TM Studios Website. Jon Wolfert did a feature on jingles from Louisville's WAKY and WKLO. This montage of "Great News, Great Music and Great People" promos from 1979 features aircheck snippets from the WAKY DJs and newspeople. "I just listened to the commercial montage on the jingles page. I remember a lot of the production. I want to mention a couple of them. Masarati boots, about 13 minutes in. The straight voice is Chris Lundy; in the background Gary Burbank does a Cheech and Chong thing. Chris was a great voice, too few examples of his work remain. Chris had been at WAKY for several years, then suddenly sometime in late 1971 or early '72 (I think) he was gone. I never learned why, just gone -- Johnny Randolph filling in for him until....did Dude Walker move from the 6PM slot to replace him? "The commercial after, Penny Pants Arcade, is all Burbank (as if you couldn't tell). Gary could sit down and knock something like this out in a few minutes. This was straight copy to be read but Gary put on his own twist. As good as he was on the air, he was amazing in production. "Around 15 minutes is an Arby's commercial, from long after my time at WAKY, with Tom Prestigiacomo and Harry Lyles. I don't know anything about it other than -- I just really liked it, great work, a lot of personality in the voices. "Just before 17 minutes on the montage is a Fredrick's of Hollywood commercial. The two main voices are WAKY sales people. Linda Boyd is the female voice (yes - she was cute and you would liked to have seen her in something from Fredrick's), I don't recall a name for the male voice (Joe ???) but he looked the part too; Gary King did the tag line. This is one of the few commercials that I wrote. Maybe this will spoil it, but the commercial never actually made it on the air; prudish times (not) the mid-70s. Nevertheless it was fun to do, fun to listen to late at night, and I had to laugh when I heard it again. "Advertising adult films was at one time a significant, though small, amount of WAKY's spots. At around 4 minutes on the montage is a less than memorable, but typical, spot for 'Behind The Green Door' staring the Ivory Snow girl (Marilyn Chambers) and showing at the Crescent Theater. WAKY had all the best adult ads. They ranged from Live Adult Entertainment and films at what I think is now The Louisville Palace to the Crescent Theatre to Theatair-X, an X rated drive-in located in Southern Indiana whose screen was visible from I-65. "Other than that it's interesting to hear spots from a number of places, most of which went out of business long ago: Playback (with an $18.88 FM converter for your car), Sizzler, Musicland, O.G. Wilson, Harlows.... Even Theatair-X is now only a shadow of its former self presently being only an indoor attraction. Oh the power of radio advertising." by Weird Beard during his WAKY days. In the early '70s Gary Burbank and some of the other WAKY jocks decided to syndicate their voices and production skills to other stations as "Broadcast Service Corporation." This Burbank-narrated demo tape features several snippets of WAKY commercials and other station production. These 1981 "thing of the past" promos (similar to ones done in 1981 for WAKY's 21st anniversary) include airchecks and promos from WAKY's Top 40 days. Some of the aircheck snippets come from longer recordings that are on this site, while others are new to us. 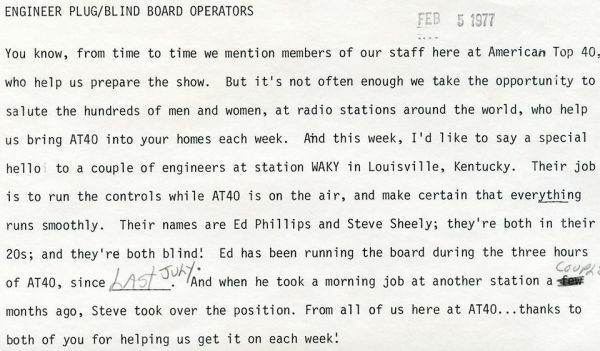 In this excerpt from a February 1977 American Top 40 show, Casey Kasem sends out props to WAKY's Ed Phillips and Steve Sheeley. Karl Shannon does the recording as Paul Stanley of KISS phones in liners for WAKY's "KISS Week" while three unidentified folks fake the voices of the other three members of KISS. You also hear "live" spots being recorded over the phone from WAVE-TV's Livingston Gilbert and WLKY-TV's Ken Rowland.